Confronted with 6 unknown persons, a pair of candidates are to guess their exact age. For that, they have in their possession an initial kitty of 100.000 euros. To help the couple keep this kitty untouched for the longest possible time, they will be given 5 clues. If the couple guesses the correct age, they win a bonus of 500 euros. But if they are wrong, each year’s difference between the real date of birth will make them lose money. He began on TV whilst still a student, on the local channel Téléssonne in 1993. In 1998, he stopped the theatre to become a scriptwriter and wrote duo sketches for the programme “Stand’up comedy” on Paris Première. 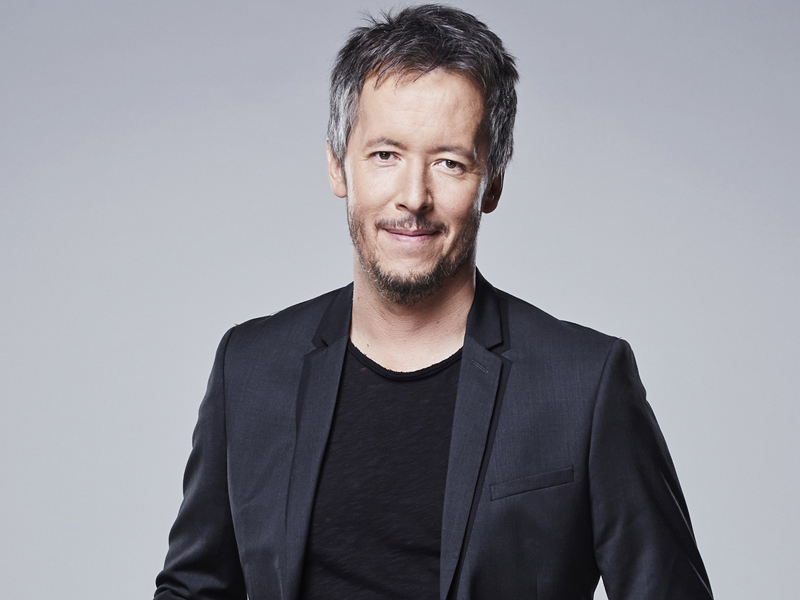 He wrote his first one-man show which was a triumph in Paris, before being noticed by Laurent Ruquier who invited him to join his team on Europe 1 from the year 2000, and then participated on his programme “On a tout essayé” on France 2 in 2001. He participated in Lurent Ruquier’s shows: “On va s’géner” on Europe 1 and “On a tout essayé” on France 2 from 2001 to 2006. He left the “On a tout essayé” team in the autumn 2006-2007 to participate to the new programme of Laurent Ruquier “On n’est pas couché” every Saturday night on France 2. He was invited in 2004 and 2008 to the programme “Fort Boyard” on france 2. On February 14th 2009, he took part in the programme Identity”. He also participated in “Culture VIP” hosted by Valérie Bénaïm and made his team win against Faustine Bollaert’s. During that summer, he hosted “L’habit ne fait pas Lemoine” in the company of Julie Raynaud, a programme for the second part of the evening which attracted up to 1.5 million viewers. In 2009, he regularly participated in the programme “La porte ouverte à toutes les fenêtres” on France 4. He animated a humoristic chronicle on the station Radio Rire et Chansons from February 1st to March 31st 2009. From September 2011, he joined the team of “Touche pas à mon poste” first on France 4 and then on D8. Jean-Luc Lemoine regularly works on Eutope 1 radio, but he doesn’t forget his first love and continues his career as comedian. While writing a show where he will be alone on stage, he was seen on television in Hero Corp and Profilage on TF1 and also at the theatre in “Amours et chipolatas”. Jean-Luc Lemoine is working on a film project talking with humour about the world of television. He was offered by the channel a special prime time programme dedicated to his chronicle “Les Questions en 4/3”. The programme was broadcast on January 30th 2015. On Monday July 11th 2016, he was hosting the new programme “Guess my age” on D8.